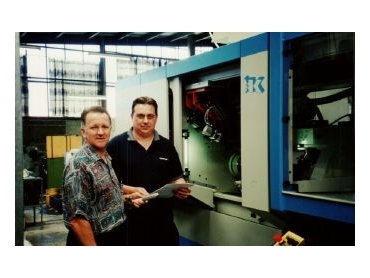 Gordon New (left) with Geoff Groves, CEO of Bowen & Groves. RONSON Gears , a Melbourne-based gear and transmission component manufacturer, has selected the Australian-developed MI ERP software from Bowen & Groves as the business management software platform which will realise the company’s growth objectives into the future. Ronson Gears, a family owned manufacturing business established over forty years ago, has invested $4 million in new capital investment in state-of-the-art, gear cutting and gear grinding machines in the past four years. This followed the creation of a detailed business plan for the company. "We set ourselves the overall objective of having the flexibility to manufacture small production runs of gears and drive shafts for our established customers, as well as producing gear and transmission components at very high volume rates." Managing director Gordon New says this vision for the company has been quickly realised. "We are currently handling one order for a customer, related to the automotive industry, which requires a production run of 170,000 units. "We scoured the USA and Europe for the latest gear manufacturing technology and selected two new major CNC production centres which have quickly demonstrated both their flexibility and capacity to meet our company objectives." The next move was to choose an enterprise resource management software package to enable Ronson to derive full benefit from the new capital investment and to really retain control over the business as it continues to grow. "When I consulted the leading gear manufacturers in the USA, I discovered they were using the MI software from Bowen & Groves. "We decided to take the step to upgrade our management systems and organised a trial of the MI software. "This worked so well for us that we converted all our company and manufacturing records over to MI during the Christmas holiday period. Bowen & Groves is the Australian-based developer of the MI ERP software specifically developed for manufacturing industry. MI offers multiple modules including ordering, job recording, inventory and purchasing management, purchasing, shipping/receiving, scheduling, estimating and quoting, interfaced with a full range of accounts modules. Significantly the MI package has been extensively adopted by small to medium scale manufacturing businesses in the USA.